Each time, the vet prescribed antibiotics. The first time it was Cephalexin. And the next time it was Amoxicillan. Hopefully, my experience with giving dogs pills will be helpful the next time you need to give your dog a pill. I found an easy way that works… every time! Before this, the only “medicine” our dog had ever taken was Benadryl. And I used to buy the liquid form — simply because it seemed easier to mix it in with his food than to try & force a pill down his throat. Better yet, rather than mixing liquid medication in your dog’s food, use an oral syringe (from your vet) to make the medicine go down even faster! Most recently, on these past 2 occasions when Tenor was prescribed pills (antibiotics), I decided it was time to get him used to taking pills. Or should I say, it was time to get me comfortable with giving my dog pills? 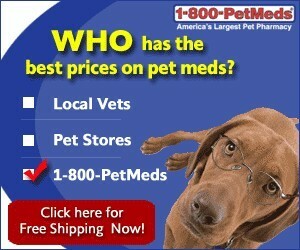 Surprisingly, I learned that it’s a cinch to give your dog medicine in the form of pills! In fact, I think that giving dogs medicine in the form of pills is quicker, less messy during the process, and there’s less clean-up afterward. #1 Make the experience of giving your dog a pill an exciting time — one that he will eventually look forward to. If that means picking the doggie treat of his dreams to “reward” him with after he takes the pill… then so be it. In our case, at first it was cottage cheese. He never gets it except when he’s sick. 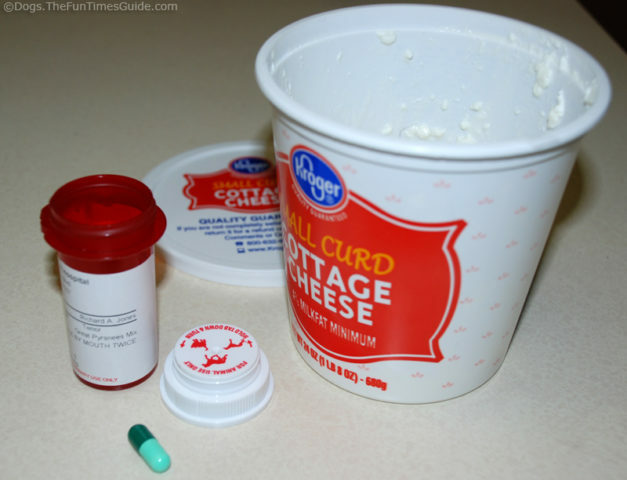 (I used to mix the liquid Benadryl in with cottage cheese… and he loved it.) Eventually, when we started giving our dog 2 pills each night for his achy joints, we began using his all-time favorite treat: doggie bacon! In addition to the “reward”, you’ll also need a lot of positive cheering and high-pitched talking to your dog to get him excited about what’s about to take place. It needs to sound like he’s about to experience something really fun — more fun than anything he’s experienced yet today! 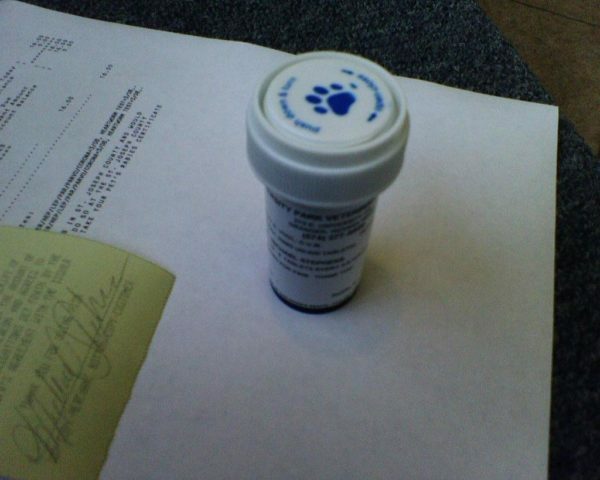 #2 Open the cap on the dog pills and place one in your right hand. (If you’re right handed.) Then, open up the lid on the cottage cheese (…this also helps to remind your dog of the “reward” that’s about to come). Then, get down on your dog’s level — maybe some hugs and sweet nothings whispered in your dog’s ear would be in order here. Just before you administer the pill, you want to look your dog square in the eyes and command 100% of your dog’s attention. #3 Cup your entire left hand under your dog’s lower jaw. 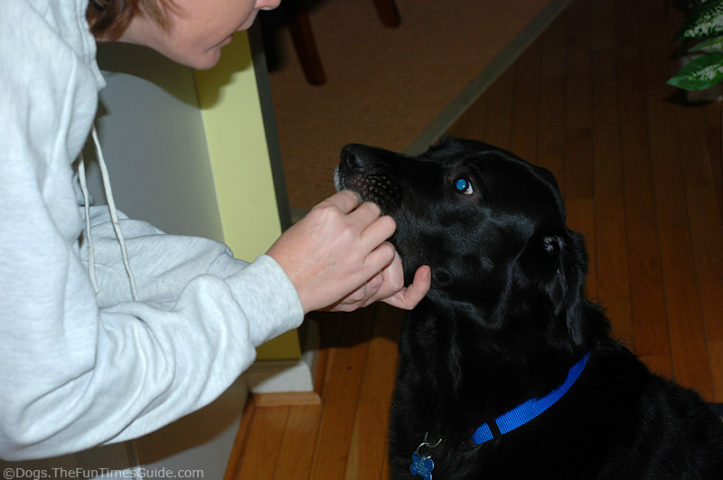 With your thumb, press your dog’s bottom lip (on his right side) against his teeth trying to get him to “open up”. Trust me, he will — simply because it’s mildly uncomfortable for him. As he opens his mouth (even if it’s ever so slightly), reach way in and place the pill that’s in your right hand all the way to the back right corner of his throat — as far as you can physically reach. It should end up in that open gap on the side of your dog’s tongue past his back teeth — not on the tongue, if you can help it. You don’t want to place the pill in the center of your dog’s throat because it’s easier for your dog to use his tongue to bring the pill back up that way. It’s much harder for your dog to use his tongue to manipulate a pill that’s placed deep on one side. And the more you do it, the easier it will be to miss the tongue altogether. The first time you do this, it may seem like your dog is trying to bring the pill up to the front of his mouth, or cough (or gag) it up. And he will — if you allow that to happen. But the action of keeping his mouth closed, talking softly to him, kissing his nose, and rubbing the bottom of his throat will prevent that from happening. #5 Now the reward. You should administer the reward (in my case, cottage cheese) as soon as it is physically possible and you’re sure that your dog has swallowed the pill. Err on the side of rubbing his throat for a longer — rather than shorter — amount of time. Then, almost without missing a beat, grab your dog’s favorite treat (in this case, the cottage cheese) and give it to him right away and very cheerfully! 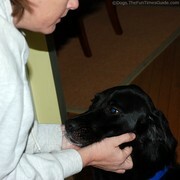 Here’s a good example of how to give your dog a pill in one step without the big “reward”. Dogs Love The Extra Attention & Treats! Of course, we clearly mark that container of cottage cheese as “not for human consumption” — but that’s only when the dog is on a 10-day course of antibiotics twice a day, because he can go through a small container of cottage cheese during that time. UPDATE: After my dog had knee surgery for a torn ACL, I started giving my dog Chondroitin and Glucosamine pills regularly. I don’t always have cottage cheese on hand, but I do always have frozen Biljac on hand! I keep some in the freezer at all times, and always have a zippered baggie filled with Biljac in the refrigerator too. So now I ask my dog if he wants his “treat pills.” Then I drop the 2 pills into the palm of my hand, grab a handful of the Biljac in the same hand, and my dog eats it out of my hand. (He absolutely loves Biljac!) Sometimes, he’ll feel one of the large pills in his mouth and spit it out. Then I just place it into the back of his throat and reward with Biljac.